Fargo residents are increasingly bicycling whether it's to commute, for exercise or for fun. 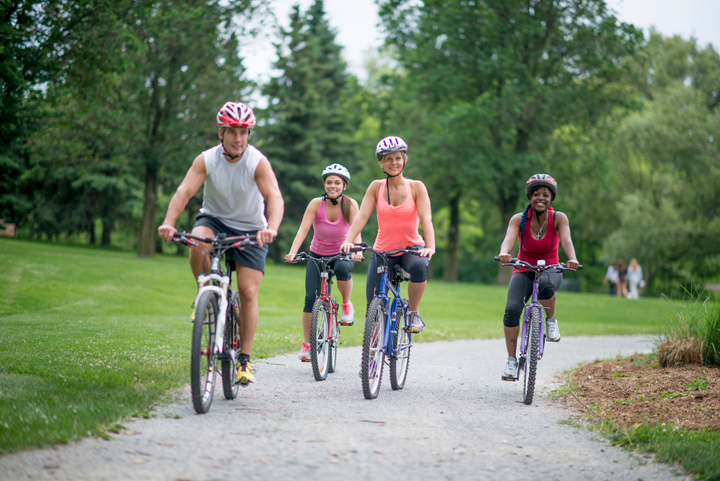 Bicycle safety is important to reduce the risk of injury in the event of an accident. Size can vary between manufacturers. Follow the steps to fit a helmet properly. It may take time to ensure a proper helmet fit, but your life is worth it. It’s usually easier to look in the mirror or have someone else adjust the straps. Ride a bike that fits you — if it’s too big, it’s harder to control the bike. Ride a bike that works — it really doesn’t matter how well you ride if the brakes don’t work. Wear equipment to protect you and make you more visible to others, such as a bike helmet, bright clothing (during the day), reflective gear and a white front light and red rear light and reflectors on your bike (at night, or when visibility is poor). Plan your route — if driving as a vehicle on the road, choose routes with less traffic and slower speeds. Your safest route may be away from traffic altogether, in a bike lane or on a bike path. Obey street signs, signals and road markings, just like a car. Assume the other person doesn’t see you; look ahead for hazards or situations to avoid that may cause you to fall, such as toys, pebbles, potholes, grates, train tracks. Drive predictably so motorists get a sense of what you intend to do and can react to avoid a crash. Every person riding a bicycle upon a roadway shall be granted all of the rights and shall be subject to all the duties which may be applied to the driver of a vehicle by the laws of this state declaring rules of the road applicable to vehicles or by the traffic ordinances of this city, except as to special regulations in this article and except as to those provisions of laws and ordinances which by their nature can have no application. Any person operating a bicycle shall obey the instructions of official traffic-control signals, signs, and other control devices applicable to vehicles, unless otherwise directed by a police officer. Whenever authorized signs are erected indicating that no right or left or U-turn is permitted, no person operating a bicycle shall disobey the direction of any such signs, but where the rider dismounts from the bicycle to make any such turn, he shall then obey the regulations applicable to pedestrians. Passengers, other than those propelling a bicycle, may ride on a seat which is mounted to the rear of the operator. Said passenger seat shall be equipped with handgrips and footrests and seat belts, or otherwise designed to prevent the occupant from falling or being thrown from said seat, and shall be occupied by the persons who are too young to operate a bicycle. No person shall be permitted to ride on any part of a bicycle other than a seat as described in (C) above. Said passenger shall be guilty of an offense as well as the party permitting same. When reasonably necessary to avoid conditions including, but not limited to fixed or moving objects, parked or moving vehicles, bicycles, pedestrians, animals, surface hazards, or substandard width lanes that make it unsafe to continue along the right-hand curb or edge. For purposes of this section, a "substandard width lane" is a lane that is too narrow for a bicycle and a vehicle to travel safely side by side within the lane. When driving a bicycle on a one-way street. Persons riding bicycles upon a roadway shall not ride more than two abreast, except on paths or parts of roadways set aside for the exclusive use of bicycles. Persons riding two abreast shall not impede the normal and reasonable movement of traffic and, on a single laned roadway, shall ride within a single lane. The operator of a bicycle emerging from an alley, driveway, or building, upon approaching a sidewalk or sidewalk area shall yield the right-of-way to the pedestrians approaching on said sidewalk or sidewalk area, and upon entering the roadway, shall yield the right-of-way to all vehicles approaching on said roadway. No person operating a bicycle shall carry a package, bundle, or article which prevents the rider from keeping at least one hand upon the handle bars or carry a package, bundle, or article which prevents the forward vision of the operator. No person shall park a bicycle upon a street or public right of way other than the curb or in a rack to support the bicycle. A bicycle shall be parked in such manner as to afford the least obstruction to pedestrian traffic. Any bicycle appearing to be abandoned on any public path, sidewalk or street may be removed and impounded by a police officer, or any other employee of the city that is authorized to issue parking citations. In such cases, notice shall be posted on the bicycle stating that the bicycle will be impounded and disposed of as allowed by law if it is not removed within three days of such posting on such bicycle. Any bicycle which remains in violation of this ordinance may be impounded and disposed of as allowed by law without further notice to the owner. The term "abandoned" shall refer to the condition of a bicycle in a state of disuse or neglect as evidenced by missing components, flat tires or other signs of disuse or neglect. No person shall ride a bicycle upon any skyway. Whenever any person is riding a bicycle upon a sidewalk, he shall yield the right-of-way to any pedestrian and shall give audible signal before overtaking and passing any pedestrian. No person shall ride a bicycle upon a sidewalk which is posted with signs prohibiting bicycles; provided that this ordinance shall not apply to law enforcement officers riding bicycles in connection with their duties. The posting of signs shall be in accordance with the latest revision of the Manual of Uniform Traffic Control Devices as published by the U.S. Department of Transportation, Federal Highway Administration provided; however, that signs not in accordance therewith shall be in full force and effect if approved by resolution of the Board of City Commissioners. Every bicycle when in use between one-half hour after sunset and one-half hour before sunrise shall be equipped with a lamp on the front which shall emit a white light visible from a distance of at least 500 feet to the front; and with a red reflector of at least two square inches on the rear, of a type which shall be visible from all distances from 50 to 500 feet to the rear when directly in front of a lawful upper beam of headlamps of a motor vehicle. A lamp emitting a red light visible from a distance of 500 feet to the rear may be used in addition to the red reflector. Reflectors or reflectorized material shall also be attached to the handlebars and front fork to reflect light emitted by lawful headlamps of a motor vehicle. Said material shall be white or silver in color. No person shall operate a bicycle equipped with, nor shall any person use upon a bicycle, any siren or whistle. Every bicycle shall be equipped with handlebars no higher than the shoulders of the operator. The driver of a bicycle involved in an accident with another bicycle, motor vehicle, or with a pedestrian, shall immediately stop such bicycle at the scene of the accident and shall give his name, age and address to the other person or persons involved. He shall also give immediate notice of the accident to the police department and shall file a report with the police department regarding the accident. In the event said accident is investigated at the scene by the police, it is not necessary for the driver to file an individual report. We have found that in the vast majority of bicycle thefts, bicycles were either unlocked, improperly locked, or locked with inadequate locking devices, such as lightweight cables or chains, or low-quality U-lock devices. You should always carry a secure lock whenever you plan to leave your bicycle unattended. The "U"- shaped locks have proven to be the most effective, but like all locks or chains, they can be defeated. Use a high-end "U"- shaped lock to reduce the chances of the lock being defeated. You should also exercise care in where and how you lock your bicycle.You should always lock your bicycle through the frame and both wheels to a bicycle parking rack, preferably a rack with a thicker frame. Lock all free parts of the bicycle as well or take them with you. If you lock only the front wheel you may return to find only the front wheel. Leave your bicycle in a visible, well-lighted area. Avoid leaving your bicycle locked outside overnight. Thieves are often creative in their approach-if they are unable to steal the bike, they may try to take any valuable parts. If left unattended for long periods (overnight), secured bicycles may get their unsecured parts stolen. The thief will secure his/her older bike to a more expensive bike that is parked in a rack or other area. The thief will wait until later in the evening when the area is clear and the victim has grown tired of waiting and has exhausted all ideas on how to locate the owner of the other bike or remove the lock. When the victim leaves in exasperation, the thief will then take all that is unsecured, tires, pedals, lights, speedometer, etc. Missing parts can average between $300-$500 or more depending on type of bike and parts taken. Remove all parts possible that may be subject to theft before leaving the area for the evening or an extended period of time. The Fargo Police Department no longer issues bicycle licenses; however, residents are encouraged to register their bicycles through the My Property program. The online program allows you to create an account, enter information about your property such as serial numbers or pictures, and later retrieve the information if you become a victim of theft or other loss, such as a fire.